You don't have to play derby to be derby strong! We’re so excited for this year’s April Angst! Grab a seat for our first MRDA event of the season! We’re starting this one off with a triple header! Don’t miss this Triple Decker! Three great games for the price of 1! Afterparty at our sponsor, Franklin’s East Falls!! We’re back and ready for some flat track action! Game 1- The She Devils will be taking on the Wilkes-Barre Scranton Roller Radical All-Stars at 5pm! Game 2 will be the B Devils vs the Brandywine Brawlers at 7pm. BYOB and grab your favorite seat on the bleachers! Kids 5 and under- Free! COME SEE WHAT PENN JERSEY ROLLER DERBY IS ALL ABOUT! New to the area and looking for something fun to do? Join us! Want to make your life-long dream as a sports announcer come true? Join us! Dying to don those zebra stripes and blow a whistle? Join us! Haven't been on skates since you were 10? JOIN US! Yes, seriously. This is less of a "try-out" and more of a "show-up." We have 2 sessions for O&A. You only need to come to 1! Session 1– Saturday, 2/2 from 12-3pm. Session 2– Sunday, 2/3 from 5-8pm. Some loaner gear is available at our facility on a first-come, first-served basis. Slay bells ring, are ya listenin’? Our last event of 2018!! Penn Jersey’s very own Shenanigans will be taking on the Pittsburgh Blue Streaks (& Friends) up on the banked track! Mistlefoes? Maybe…All we know for certain is that the halls are gonna get decked! Thanks to Andrew Keyes Derby Photography for this shot! Winter is coming! The first of two banked track events to close out our home season! Join us December 8th for a banked track double header on our track Judy! The Arizona Derby Dames’ Hot Shots are flying in to play the She Devils at 5pm and at 7pm our intermediate class will show their new-found skills in a Red vs Black game! Both games will be played under the RDCL ruleset. Grab a seat on the bleachers and BYOB (Blanket, Beverage, Beagle, and Bestie) and settle in for action-packed thrills and chills! Fall is in full swing, let's celebrate with a double header! Penn Jersey vs Jersey Shore! 2 games for the price of one! It's an offer you can't refuse! Both games played on the flat track under WFTDA rules. Come on down and grab a spot on the bleachers! Bring your puppers, bring your kids, bring a bevvy if you’re so inclined! Afterparty at our sponsor- Franklin's East Falls! 2 games, 2 tracks, 1 day!! Grab a seat on the bleachers and join us for this historic PJRD double feature- our very first banked and flat track double header! Game 1, 3:00pm- Flat Track Intermediate game featuring our Newest Rookie Graduates! Intermission show by The Mega Yeah! Check them out on Facebook here! Game 2, 6:00pm- Banked Track game, our very own She Devils take on Team Maryland! Congratulations to our Hooligans who have earned a spot to play in the MRDA Championships in Salem, Oregon!!! To follow along at home, click here! September is a happening month here at Penn Jersey! The Hooligans are having their own flat track double header on 9/1, then our world famous Derby Q on 9/2. The action doesn't stop there so let's hear it for the She Devils and B Devils on 9/15! They'll be taking on the Salisbury RollerGirls in a WFTDA double header you won't want to miss! Come join us for our 11th annual, award winning, Labor Day edition Derby Q! We're closing out the summer the best way we know how--with 2 banked track scrimmages and a 'Murica loving BBQ at our warehouse! (And you're invited). It will cost you $15 to play, $10 to watch and is open to all roller derby skaters, friends, family members, and significant others who can make it to our warehouse. Any ruleset. Any league. All are welcome! Get acquainted with the banked track. Get some pointers. Just have fun! Two level scrimmages that will be mixed gender and played under RDCL rules. Must be 18+ to play and have passed minimum skills. If you're scrimmaging, make sure to bring BOTH a red and a black shirt and sign up at the link below. Spectator or skater, the barbecue will follow the scrimmages and last until...we don't know, whenever you guys get sick of us and decide to leave? Vegetarian/Vegan/Gluten-free options will be available. We'll definitely have warehouse beers on hand, but feel free to sneak in your favorite beverage! Starting September off strong with a MRDA double header featuring the Carolina Wreckingballs, Harm City Havoc, and of course, your very own Hooligans! 2 games for the price of 1! Grab a seat on the bleachers and BYOB cause you won't want to miss it! Afterparty @ Franklin's Pub East Falls! Our second annual flip-cup tournament! You saw right! PJRD's favorite after party game is coming to you tournament style! All proceeds benefit the league, so come out, have fun, and play for your chance to WIN some great prizes, including miller swag, pjrd merch, and $100 gift card! Tournament will be Double Elimination style. -6 cups must be flipped per round. -10 teams maximum, with up to 8 people per team (you can have 6 people flip one each with 2 subs, or 3 people flip 2 cups per round...etc). -10 registration fee for each participant. Team spot will not be guaranteed until payment is received to PJRD's Paypal. -we recommend you and your team wear the same shirt or same color so you're easily identifiable! Click the link to sign up and reserve your spot! It's the middle of the summer, let's celebrate with a double header! 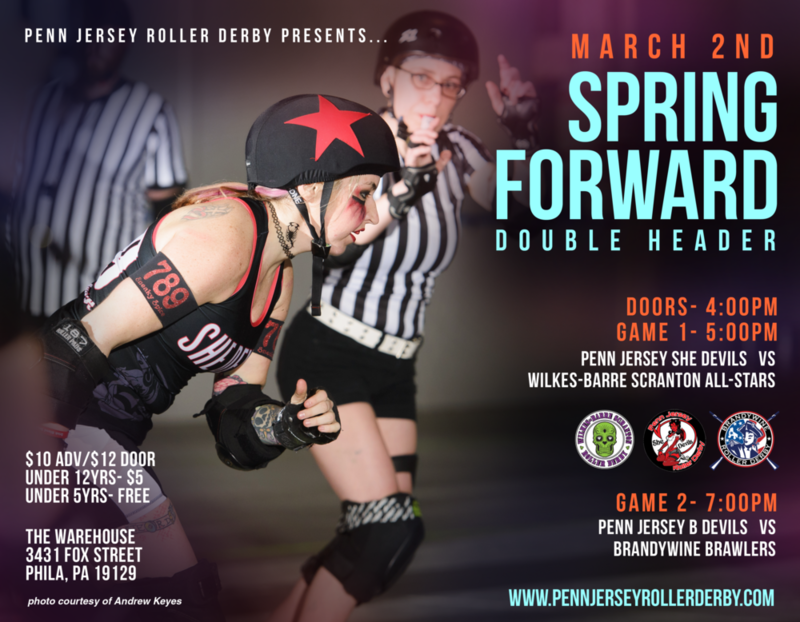 Penn Jersey Roller Derby vs New Jersey Roller Derby! Come on down and grab a spot on the bleachers! Bring your puppers, bring your kids, bring a bevvy to stay cool! The Hooligans have their first invite to the Sibling Rivalry Tournament, hosted by the St. Louis Gatekeepers! Not technically a "home" game, but come cheer on the She Devils at their first appearance at ECDX, hosted by Philly Roller Derby. Event is located in Feasterville. Hey hey! It's graduation season over here at PJRD! Come cheer on our newest skaters as they take to the track in their very first game! Doors at 4, Game at 5. Afterparty at our sponsor, Franklin's East Falls! Session 1– Saturday, 6/9 from 12-3pm. Session 2– Sunday, 6/10 from 5-8pm. Reminder that this event will be the first in our NEW LOCATION! 3431 Fox Street. Don't go to Indiana Ave, cause we won't be there! The 11th Annual Battle on the Bank tournament will be held from 6/1 through 6/3 in Seattle. Hosted by the Tilted Thunder Rail Birds. Come join us for our 10th annual, award winning, Memorial Day edition Derby Q! Penn Jersey Roller Derby will be hosting 2 banked track scrimmages followed by a 'Murica loving BBQ at our warehouse! (And you're invited). It's May! Come on out on the 19th! We're back from the Battle at Bunker Hill and ready to take on the next two teams at home! First up, the Shenanigans will be playing Harm City Havocs @ 5pm. Then the She Devils are taking on the Dutchland Rollers @ 7pm! BYOB! Bring your own beverage, buddy, beagle, bulldog and/or any two or four-legged bestie...and grab a seat on the bleachers for some killer derby action you won't want to miss! 3431 Fox Street- our new warehouse! Afterparty at PJRD Sponsor- Franklin's East Falls! She Devils and Hooligans in the same tournament! Hosted by Mass Maelstrom! 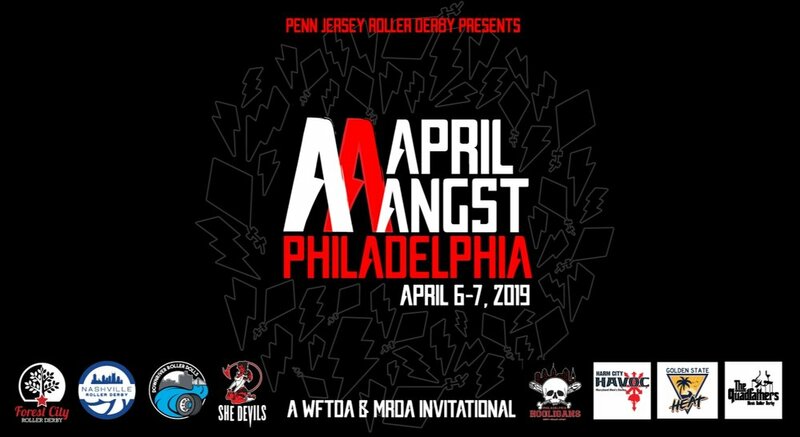 Come join us in the city of brothery love for an exciting weekend of men's roller derby! Remember March Manness? It's like that, but now in April! The following teams will be playing full-sanctioned games over two days! -And of course our very own Philadelphia Hooligans and Shenanigans! An A and B team double-header on the banked track! LA is coming 3000 miles just to play on our Banked Track, Judy! First game of this action-packed double-header will feature the B teams! Penn Jersey's B Devils will be taking on LA's Doll Parts, and the second game will be She Devils vs LA Ri-Ettes! This is the She Devil's ONLY banked track game at home this season, so you better get there! It's the middle of the month and we need derby action! In this flat track double header, our very own Hooligans will take on Philly Roller Derby's Liberty Belles, and our Shenanigans will be taking on the Flour City Fear! But why "beware?" We're threatening you...WITH A GOOD TIME!